The French word for ‘track’ has become the accepted term for off-highway driving in the Sahara, but what are pistes? Just about all of today's routes in and across the Sahara originated as trade routes over the last few thousand years. Like all roads in the world they link major settlements or economic nodes, which themselves were set up around a reliable water source; the key resource of all settlements. As the Sahara became more arid following the Neolithic era (see p.384), caravan routes followed a string of wells along the line of least resistance, just as today's highways do. In the Sahara ‘least resistance’ means avoiding the bigger sand seas (some of which are hundreds of kilometres across) and, where possible, would have meant skirting mountainous, hyper-arid or ambush-prone regions. Therefore, principal pistes generally follow flat, open ground, linking one oasis to another from the south of the Sahara to the north in as direct a route as possible. The network is completed by minor lateral pistes, a few pushed through in recent years by bulldozers in the course of exploration for minerals. Some major pistes are now sealed roads of course, and during the lifespan of this edition the Sahara will finally become sealed from north to south along the Atlantic Route through Mauritania (see p.464). In present times, the advent of recreational off-roading has given Saharan pistes a new purpose. Originating in the 1960s with the earliest overland companies, Saharan motor tourism boomed in the 1980s in Algeria, helped in no small way by the glamour associated with the then popular Parisï¿½Dakar Rally. 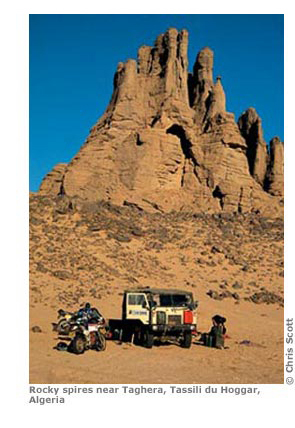 The advent of civil unrest in northern Algeria as well as a rebellion in Tuareg homelands put the brakes on Saharan adventure tourism just as the ownership of four-wheel drives and ‘Dakar’ replica trail bikes was catching on. Since that time, Mauritania, southern Tunisia, Libya and even parts of Chad have opened up to cater for the European desire to experience the desert, either independently or on a tour.